Naturally, I began to look for products that are 100% natural, and harmless and at some point in my searching, I discovered a lot of youtube video appraisals of Jojoba Oil. 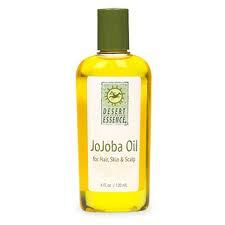 Jojoba oil aka Simmondsia chinensis has some remarkable qualities. It is a liquid wax derived from the seed of the Jojoba plant, which is native to Southern California, Southern Arizona and North West Mexico. It has antibacterial and anti-fungal properties. Perhaps most remarkable of all, is its molecular structure, which is so similar to the structure of our sebum that it tricks our skin into reducing its sebum output. The result of this is that acne is rapidly quelled. I use it on my face and rashy areas of my body – just a couple of small drops – and have found that it is far superior to any other skin product I’ve used. It can also be use as a hot oil treatment for hair, though I would only use it for this purpose occasionally. Because only a few drops are necessary, it lasts for a very long time. I just wish I had discovered it sooner!